The brief ride south of the capital was uneventful, but the noted chill in the air was beginning to be felt as the day was coming to a close. The silver moon could already be seen peeking, patiently awaiting its turn, when I disembarked and was welcomed into the private sanctuary of Mally Peltier of Mally's Taxi. Mally, 75, who is the father of 11 children, took me back to his school days when he was growing up in Loubiere, when he had to walk two miles every day to go to school at Newtown. "I used to play cricket, football; I used to help my father on the estate (in Pointe Michel, and Mahoe) then from school in the afternoon I used to learn tailoring in Newtown by New Born tailor (close to the Newtown savannah)," he said. Mally learnt how to drive when he was employed at Astaphan; he stayed at the company for about a year and left to join his father's business when the opportunity arose. His father owned a truck and he was left short-staffed when his employee left the island for greener pastures. The all-purpose truck carried mainly passengers, agricultural produce, sand and stones. "I drove for my father for seven years (and then) I went to Trinidad; I stayed there a little while, and I saw the movement of taxis using cars," he said. At that time, Peltier said, Dominican trucks were the main form of transport for people, but, "these people had cars, so when I came back here I introduced cars." He also introduced something new: instead of hires he ran short routes from Roseau to Loubiere and Pointe Michel later on. "I started with one car and I ended up having four cars and then I went to busses, because I had seen busses in Trinidad also. I bought a small bus and started carrying people from Roseau that Loubiere as far as Pointe Mitchel then I started going to Melville Hall," he said. The veteran businessman said as time went on he owned about six vehicles, and his wife who was a school teacher got pregnant and started working with him. Before becoming a taxi driver, Mally said he experimented with various jobs such as plumbing, electrical work, construction and he even built his own home where he resides with his family. "When I looked at it, taxi was the easiest one around so I kept doing taxi. I am there for about 54 years now," he said. "It was a lot of hard work, working sometimes 24 hours a day, not only that I used to have the truck carrying bananas, people, stones so during the day time when its banana time starts, at times, to be honest, my children hardly see me. "Sometimes I don't come for lunch, I eat on the way and when I come back the children are sleeping. Sometimes for days they wouldn't see me... It was hard work and dedication." Today the company operates from their Cork Street office where his sons, Marvin and Dervin, manage the family business. Although Mally claims that he has retired, he takes an occasional trip to the Melville Hall airport, oversees his farms, taxi business and rental properties. The company now owns 12 vehicles. 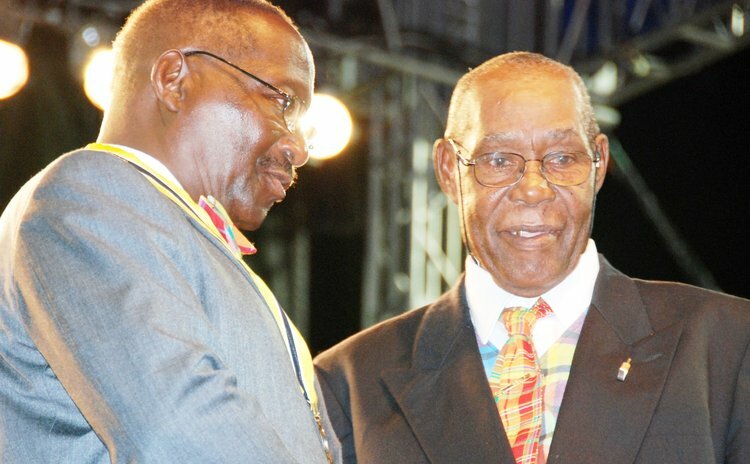 He has received several awards; they are displayed on the walls of his office and home, including the Services Medal of Honour bestowed on him by President N.J. O Liverpool in 2008 for over 40 years' service to the taxi business. And as we sat on the comfortable cushions of his modest family home paging through his photo collection, he brought me along on the journey of his life. I concluded that this was the journey of a man who dedicated his life to his work of making his passengers happy and he is now reaping the benefits of hard work.